Sweet Tooth has just been given a pilot order from Hulu. The Eisner-nominated Vertigo comic was written and drawn by Jeff Lemire and ran for 40 issues from 2009-2013. 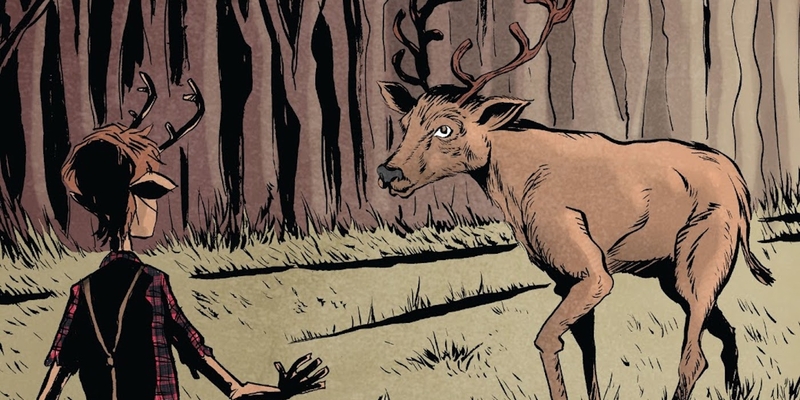 Sweet Tooth is a post-apocalyptic fable centering on a deer/boy hybrid named Gus. Raised in the middle of the woods by his father in an attempt to protect him from the outside world, Gus finally ventures out from the safety of his home after losing his dad. Along with a ragtag group of humans and hybrids, Gus embarks on a dangerous journey looking for answers and ends up uncovering a vast conspiracy in the process. The comic was praised by critics and readers alike for Lemire’s unique art style, as well its engaging story and characters. Now, Robert Downey Jr. will help bring the comic to life on the small screen. Deadline reports that Hulu has given a pilot order to an adaptation of Sweet Tooth. The project is to be produced by Team Downey, the production company founded by Robert Downey, Jr. and his wife Susan in association with Warner Bros. TV. Amanda Burrell and Linda Moran are also on board as executive producers, along with Jim Mickle (Hap and Leonoard), who is attached to write and direct the pilot. This won't be Hulu’s first foray into comics, as season 2 of Marvel’s Runaways is set to premiere December 21st. Sweet Tooth is the latest comic from DC’s Vertigo imprint hoping to find its way to the small screen. After spending years trapped in development hell, a pilot for Y the Last Man was finally ordered by FX, with production beginning back in August. Meanwhile, Lucifer was recently rescued from cancellation by Netflix, while Preacher continues to air on AMC and iZombie is preparing to enter its fifth and final season. Vertigo still has an impressive collection of material to mine from, with plenty of amazing series that have yet to be adapted, such as The Sandman, The Invisibles and Fables. Sweet Tooth is an incredibly compelling story from start to finish. Considering their long-form style of storytelling, comics lend themselves to the television format (which is something Kevin Feige recently touched on regarding the future of Marvel TV shows), and Lemire’s sprawling epic certainly needs several seasons to unfold. His distinct visual style and complex narrative won’t necessarily be easy to adapt, but they are quite cinematic in scope. And, as of now, next to nothing is known about the project thus far, aside from the pilot being ordered. That said, even though a pilot order hardly guarantees the show will be picked up, Sweet Tooth fans will no doubt be hoping for the best.